Linda MacKay is a native Calgarian, a resident in the foothills near Millarville, Alberta and also spends part of the winter in Kona, Hawaii. 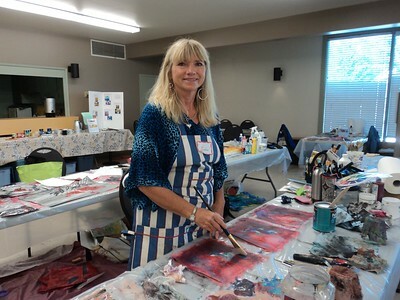 Although she began her working career as a corporate planner and economist in the oil and gas industry, she has focussed on her art, garden, and horses for the past 20 years. Linda went on to pursue the prestigious London City and Guilds Design and Embroidery certificate from England and has taken many painting and textile art classes from renowned instructors and done much study and exploration on her own. She has taught quilting, dyeing, textile art, creativity, and general art design in the past but currently tends to focus on her art production more than in teaching. Regular self-directed study and experimentation. Studied under various artists and fibre artists from 1990 to present. — other public facilities in Alberta. I love the creative process and am drawn to originality in my work in whatever form it takes. I love to paint, dye, quilt, embroider, manipulate textiles, and discover new and different ways to portray an image or idea. I often oil paint realistic portraits to discover discipline, technique, and to 'see'. But I am drawn to mixed media abstracts, impressionistic, expressionistic, landscape and portraits. I have worked in oils, acrylics, collage, textiles and miscellaneous materials so I can use them interchangeably or use them stand alone depending on the look I am after. I am inspired by my surroundings and see the world in color, pattern, and texture. Sometimes I work totally from my imagination but usually I use photographs, sketches, or research as a starting point. I sometimes incorporate a spiritual message into my work in thanks to God for blessing me with the gift of art and the passion to create.